In order to facilitate faster time to market, Critical Link developed a family of off-the-shelf hardware modules that provide a wide range of flexible I/O and data acquisition capability that is ready to roll with the MityDSP-6455F SoMs. 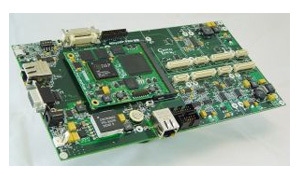 The MityDSP-6455F Development Kit provides a mother card that includes a MityDSP-6455F interface socket, dual 10/100 Ethernet PHYs, 6 Mbit USB PHY, and RS-232 drivers for communications, an LVDS LCD interface connector, a Camera Link interface, an 8 channel analog to digital converter and an 8 channel digital to analog converter to get projects started. The mother card also provides additional Hirose connectors for add on modules as necessary for specific application needs. The Hirose connectors provide direct FPGA interface to the MityDSP-6455F, allowing customization of the motherboard configuration. Critical Link provides several modules and cores that integrate directly with the available MityDSP Core FPGA and DSP libraries. In addition, custom modules may be developed (by Critical Link, or a third party) to suit a particular need. This technique greatly reduces the scope of non-recurring engineering, as less focus is place on common infrastructure and more on your particular application needs.